In stock -This product will ship today if ordered within the next 9 hours and 19 minutes. Floradix Gallexier Liquid Herbal Formula contains Artichoke which is a vegetable native to the Mediterranean region. The benefits of the bitter substances contained in the leaves of artichokes have been recognized and appreciated since as far back as the 16th century. 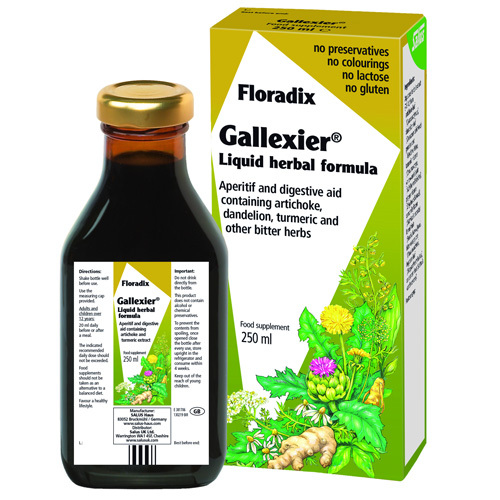 Floradix Gallexier Liquid Herbal Formula contains among others, artichoke, dandelion, turmeric and other bitter herbs such as gentian and ginger. Artichoke, dandelion, turmeric, ginger and cardamom all help to support digestion. In addition, dandelion contributes to the normal function of the intestinal tract. Turmeric and dandelion stimulate the appetite. Gallexier is suitable for vegetarians and vegans. Artichoke leaf (Cynara scolymus), dandelion leaf (Taraxacum officinale), gentian root (Gentiana lutea), turmeric rhizome (Curcuma longa), yarrow aerial part (Achillea millefolium), ginger rhizome (Zingiber officinale), camomile flower (Matricaria recutita), fennel fruit (Foeniculum vulgare), bitter orange peel (Citrus aurantium), bogbean leaf(Menyanthes trifoliata),cardamom fruit (Elettaria cardamomum). Fructose syrup. Adults and children over 12 years of age: Take 20ml before or after a meal. The indicated recommended daily dosage should not be exceeded. Food supplements should not be taken as an alternative to a balanced diet. Favour a healthy lifestyle. 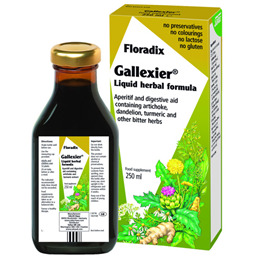 Below are reviews of Floradix Gallexier Liquid Herbal Formula - 250ml by bodykind customers. If you have tried this product we'd love to hear what you think so please leave a review. Floradix Gallexier Liquid Herbal Formula contains Artichoke which is a vegetable. The benefits of the bitter substances contained in the leaves of artichokes have been recognized and appreciated since as far back as the 16th century.